Location, Location, Location. This illustrious word echoed three times has become a defining sentiment of New York City lifestyle. Fashion and real estate are at the pulse of the city, and when the two convene, New York City falls into true form. Making the right venue selection for your fashion show can heighten the creative impact of your event; elevating the experience to the next level. It is important to know precisely what you and your guests will need from an ideal venue location. 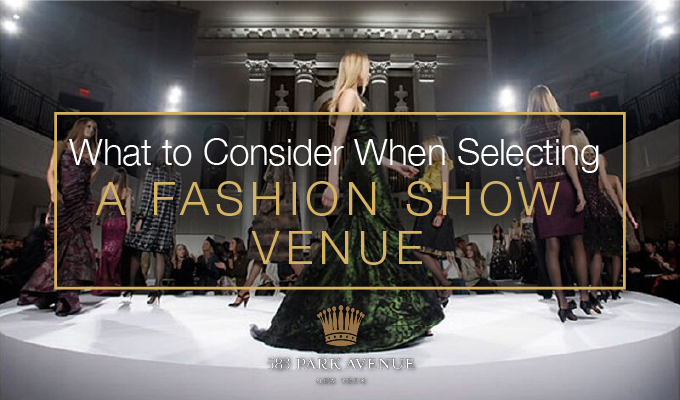 Below we define the four factors—from creative to logistic—to consider when selecting a memorable fashion show venue. Every fashion collection has a narrative. The inspiration during the creative process creates a unique perspective on design, and also influences the narrative behind the wearer. The clothes lead a story; she is a trendy Parisian 20-year-old lounging at a brasserie with her girlfriends or a jet-setting business women traveling to Marrakech on vacation. The clothes are the starting point, and the runway is the 15-minute expression of the full story. The venue plays an integral part in tying this narrative together. From the architecture, to the height of the ceilings, to the history of the venue, everything attributes to the final interpretation of your collection. In addition to visual compatibility, you need to consider whether your venue is able to accommodate a runway platform that suits your desired specs. 583 PARK AVENUE is rich with history and allows for multiple floor plans across our diverse spaces. One of the first things to consider is how your venue will facilitate event flow. New York Fashion Week is a chaotic time, yet you still want everything to run as close to perfect as possible. Your special events and PR team will be dealing with lots of press, talent and VIP guests, so check-ins need to be easy and smooth in order for guests to move along quickly and begin their event experience. Once your guests are through check-in, you’ll want them to have a top notch experience. 583 PARK AVENUE has the highest guest to staff ratio in New York City and our arcade is a breathtaking space to host pre or post-event cocktails. Every fashion brand has their defining aesthetic. Brands that are known for their eccentricity, often take to the runway to push creative boundaries, providing viewers an unparalleled sensory experience. Designers are becoming more and more experimental; incorporating special effects, live design demos, dance choreography and more. Take for example Alexander McQueen’s 2006 “Widows of Culloden” show in Paris that featured a moving hologram Kate Moss on the runway. This groundbreaking special effect quickly received worldwide notoriety and became a highlight of Paris fashion week. If you are looking to create a similar buzz by incorporating theatrics and special effects in your show, make sure your venue is equipped to facilitate these unique features. At 583 PARK AVENUE, we’ve assembled the best in the business to ensure your event is as impactful as possible. Are you planning a fashion show in New York City? Contact one of 583 PARK AVENUE’s Event Coordinators today to learn more about our venue. This entry was posted in Private Events and tagged event planning, fashion show, fashion week, location, new york city, NYFW, real estate, runway show, venue on January 21, 2016 by Pooja Dhuldhoya.